Youghal Needle-lace grew out of the need for employment during the potato famine of 1846. A piece of lace of Italian origin came into ownership of Mother Mary Ann Smith of the Presentation Convent, Youghal Co Cork. This piece of lace was unraveled by the nun, who carefully examined how the piece had been executed, and then mastered the stitches. Children in the convent who had shown an aptitude for the needlework were then taught by Mother Smith what she herself had learned. 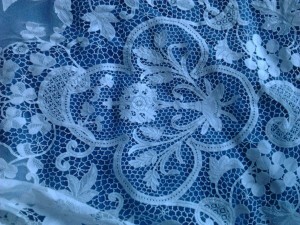 This lace is made entirely by the needle, and the thread used is of very fine cotton. In 1852 the Convent Lace School was opened. The school flourished achieving many noticeable highpoints. In 1863 a shawl of Youghal lace was presented to the Princess of Wales, (later Queen Alexander) on the occasion of her marriage to the future King Edward VII. This was the first of many presentations to the Royal Family of England. Several medals were awarded to Youghal Lace in international exhibitions over the years including the Vatican Exhibition in 1888, the Chicago World’s Fair 1893, RDS, and Exhibition of British Lace in London 1906. After the death of Mother Smith in 1872, work in the Lace Room was carried on by Sister Mary Regis Lynch, who was instrumental in producing many new designs for the lace. The School continued to flourish until the advent of World War I. This effectively did away with many lace markets, although the nuns continued to make lace until the late 1950s. 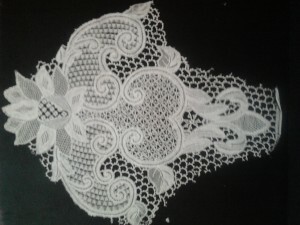 In 1987, Veronica Stuart from Carrigaline, Co Cork, in conjunction with Sister Mary Coleman, Presentation Convent, Youghal, unraveled a piece of Youghal Lace, just as Mother Mary Ann Smith had done, stitches were learnt and techniques noted. Mrs Stuart traveled to the Continent to perfect her skills in needle-lace and in 1989 she began teaching Youghal Needlelace, happily thus ensuring the survival of yet another old lace.